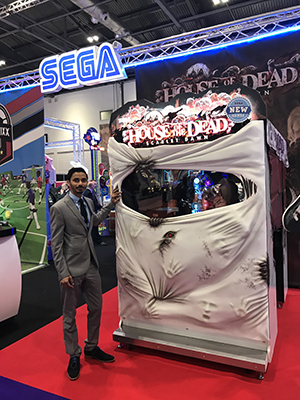 Sega Amusements introduced Europe to nine new games at the UK’s EAG show last week, including its House of the Dead and ATV Slam. With House of the Dead, Sega has walked a fine line between a game that might have been too frightening for younger children, but still appealing to older ones. It has, however, traversed this tightrope with apparent ease. “This is the horror action game for future, packed with features. It delivers thrilling fun for everyone”, said Lester Travasso, sales and marketing executive. Effects including lighting and fans make the fun more interactive during gameplay. The about of the cabinet features an interactive feature to attract customers to the unit. Also new in Europe was Sega’s ATV Slam and Pixel Chase. ATV Slam, an all-terrain vehicle racing game, features ten exotic environments, five different vehicles - each with different power and design, wind effects and razor-sharp console quality graphics. 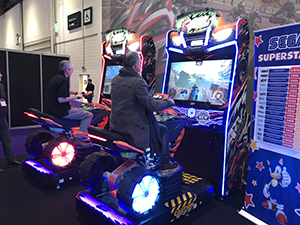 A life-size quadbike with huge back wheels, along with effects including lighting, fans and a moving platform all give the gameplay a rugged, realistic feel. In Pixel Chase, players demonstrate their pitching skills by throwing as many balls into the 4x4 LED lit target holes within the time limit. The company also exhibited wares from ICE including Waterfuls, Whack A Clown and Superkixx. Other European first include Sega’s Ball Runner, Hot Racers and Sonic Kids Basketball.